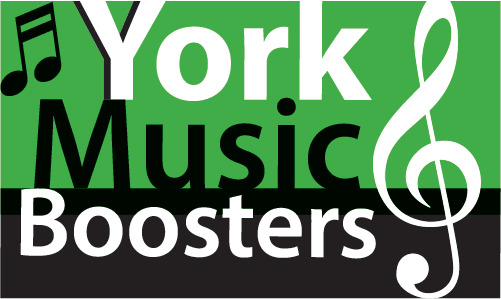 The York Music Boosters' mission is to support York's Musical Arts Department and its students by funding and supporting music events, grants, and scholarships. Please join us in supporting York's wonderful music students! Pay for your membership online or by regular mail. Find out more about different membership levels and benefits by visiting the Membership page. York Music Boosters offers grants and scholarships to music students to offset costs of pursuing additional music enrichment opportunities. For more information, visit the Grants and Scholarships page or contact Diane Hund. YMB holds several fundraisers throughout the school year to directly benefit York musicians. Visit our Fundraising page to learn more. YMB handles the distribution and collection of formal band and orchestra uniforms. To learn more about formal concert wear, visit the Uniforms page. For Marching Band uniforms, contact Mr. Riddle or Mr. Pavlik. For Choir formal wear, contact Mrs. Marianetti. YMB is now accepting applications for Summer Music Camp Scholarships. Applications are due April 26! View all upcoming Performing Arts events. The next YMB board meeting is April 8, 7:30pm, in York's Music Production lab. Concert Ushers are needed for upcoming performances. Please sign up to volunteer! Several board positions are open for the 2019-2020 school year. Please consider joining the YMB team! Contact Nicole Braun for more information. Join our email list. Specify "YMB Mailing List" in the subject line. Contact a Board Member or Committee Chair.